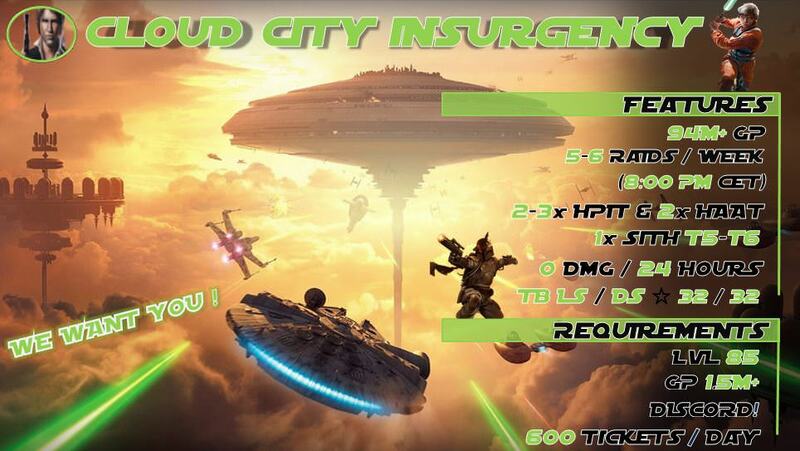 we are the Guild "Cloud City Insurgency" and looking for 3 players to fill the last spots. We are people from all around Europe and we all speak english in chat. For e.g. we have Austrian, British, Norwegian and German players (i am one of them) here. Our guild originally came from norway but now we have started recruiting more international players to have a better growth potential. The guild is democratic, and officers and leaders can be voted in and out of office. We are "hungry" and love what we achieve, but we also respect Real Life and we are not robots. Just let us know, if you can't spend some days Ingame or when you are on vacation. Able to contribute regularly to raids, TB, TW. Ideally you have some of the characters we miss for TB platoons. We think of a high starred Holdo, Rose, Wampa, Imperial Probe Droid and/or Hermit Yoda. A chance at getting Kenobi shards if you do not have him. The opportunity to get ROLO and IPD shards. A good group of people to play with. While we are serious, we understand people have real lives - mortgages to pay, food to put on the table, kids that are crazy, etc. Many of us have played this game together a while now, and have become friends in the process. And hopefully sooner than later - Traya shards - that is, with your help! 45/50 -> still open slots for you! 3 potential spaces are still open. Still 49/50. Join us today and get the last free slot. The last spot is currently reserved for one potential candidate. Still searching for one strong player to fill our last spot. One in, one out. So still 49/50. Still looking for one strong player to fill the last spot. One in, one out = still 49/50. One last spot is still available for you! One spot is temporary reserved = 49/50.